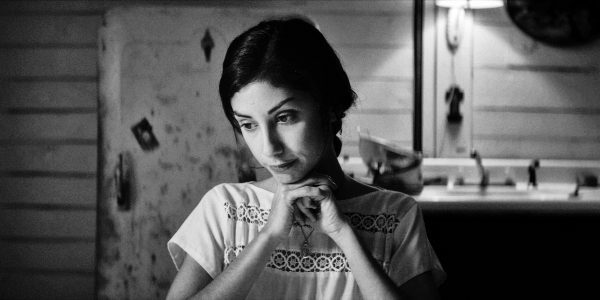 "I was always fascinated by how the inside of the body looks"
The Eyes of My Mother, the directorial debut of Nicolas Pesce, is a deeply disturbing black-and-white horror film about a lonely young woman with a dark secret. 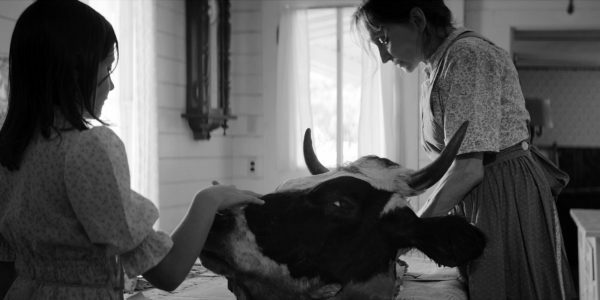 Francisca (Kika Magalhães and Olivia Bond, as young Francisca) and her mother (Diana Agostini) and father (Paul Nazak) live a quiet, peaceful life out in the country, raising and caring for cows and other animals. When a deranged traveling salesman (Will Brill) kills Francisca's mother, her father locks him in the barn, where Francisca removes his eyes and tongue. She feeds and take care of her now mutilated prisoner, because she's lonely. Yeah. Francisca's need for companionship is the driving force behind The Eyes of My Mother and the dark, disturbing depths to which she goes to avoid being lonely leave a lasting impression. The focus is on atmosphere and psychological horror - while there are a few gross-out moments and some blood, The Eyes of My Mother nearly always skips the actual violence. Rather than show a murder, for instance, the movie will cut to Francisca cleaning blood from the floor. There are also no jump scares to be found - although to be honest, the way The Eyes of My Mother consistently manages to keep you on edge, it could have actually utilized a few jump scares to great effect. Long takes and static compositions are this movie's bread and butter and they help build and maintain tension. There are many points where you know exactly what's coming, but you desperately don't want it to happen, like a scene where Francisca invites a young woman she meets at a bar over to her home - the slow, measured pace makes those moments all the more horrific and there's a general feeling of unease that just lingers even long after the movie's over. The performances are very minimalist. They're good, but The Eyes of My Mother conveys much more through composition, editing and sound than it does with acting or even dialogue. Where the movie stumbles is in the way the story is resolved. While technically a fitting end, it feels abrupt and overall there seems like there was more to explore here, especially since the whole movie's clocks in at just 77 minutes. Perhaps a bigger focus on the mother and father, or on some of the other characters introduced later could have benefited the story. We get very little context for Francisca's disturbed psyche. Did the death of her mother trigger a change in young Francisca or was there always something there, bubbling under the surface? The movie maintains a certain distance from its characters that makes questions like that difficult, if not impossible to answer. Still, this is a very promising debut from writer and director Nicolas Pesce. 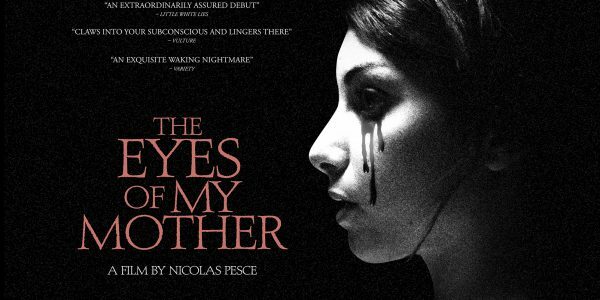 A deeper exploration of the psychology of the characters and a more satisfying conclusion would have been greatly appreciated, but as it stands, The Eyes of My Mother is a very disturbing and highly unnerving horror movie. Park Circus will release The Eyes of My Mother in UK Cinemas on 24 March, 2017.